In other news...guess what this is! You finally blocked it! Great! 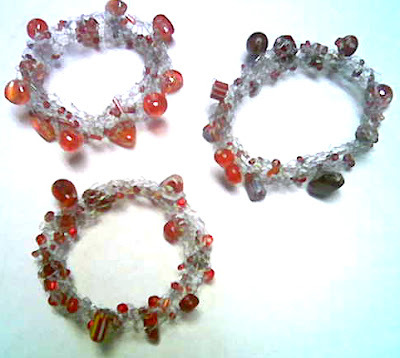 The napkin rings are so very beautiful and fragile looking, what an awesome gift! And I'm really impressed by the beauty of your shawl - it seems as if you did a real great blocking job and mind you, I can't wait to see it after blocking in all its glory! Julie's rings came out very nice! And ooooooh, look at that gorgeous shawl! I can't wait to see the whole thing! Hi BB - I blocked it on the livingroom floor. *g* Here's the plan: I wait until evening, put the kids to bed, make sure the cat is still in the garage, wash the shawl, pin it out and then sometimes put a table over it. Then, in the morning, I unpin it and fold it up before anyone goes in the room. It only works for shawls, because they dry so fast! Sweaters are another story. Hooray for you! 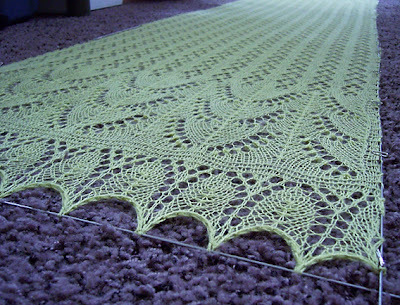 I'm glad you finished the EG shawl; it looks wonderful. (Insert clapping sounds from a northerly direction). That is absolutely gorgeous. Well done!